Got a salad here today... it sounded great on the menu, but when I got up to the window and paid I was handed a pre-made salad out of the fridge. I was not impressed--it tasted like a salad you would get at Cosi and the ingredients were somewhat stale. I also found a hair in it. Reuben was delicious, and came with a pickle & bag of chips - employees were very friendly & the sandwich was excellent, will definitely return! Pretty good sandwich. The flatbread is a nice change of pace, and the ingredients seemed to be good quality. I like that they throw in some chips, as I like a few with my meal by don't like shelling out a buck or more for a bag. I will say that it wasn't spicy at all to supposedly have chipotle in it. There were two people working the truck so service was quick. My rating is 3.5 stars but I'm rounding up to 4 because the people were nice and friendly. Will definitely go back once or twice a month. Chicken Philly Cheesesteak was very good! Extra bonus points for compostable containers. Can't wait to try the reuben. The Alamo Salad was very good. Caution, The prices posted below are inaccurate. 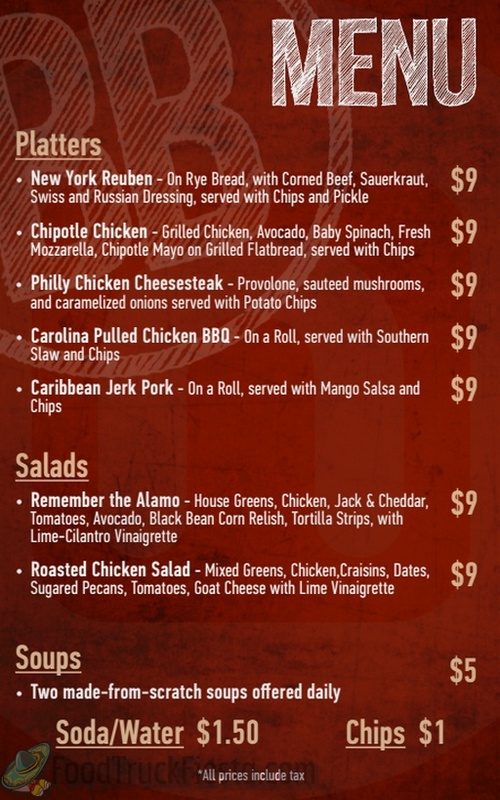 Today the prices for everything (which only consisted of the Reuben, Chipotle Chicken Sandwich, Alamo Salad and the Chicken Salad on the menu were $9. Only one person working in the truck so the line was slow. They were also unable to take credit cards when I was there. They have a solid Reuben, especially in this deli desert in which I work. Corned beef was a bit on the salty side (even for corned beef), but sliced well. All the components of the sandwich were well balanced (kraut, dressing, Swiss, beef). Not a ton of chips served (though I consider that a good thing). The pickle was a bit on the puny side, though. Sandwich was still hot after the 2 block walk back to my office. enourmously flavorful and tender chuncks of pork! didn't really need the mango salsa for teh juicy chunks or mouthwatering pork. I will be back! I know they are new. But: they do not update their location for the new day in a timely manner. They only use one or two guys, not enough. Need three (1 to take tne orders and money). Not prepared for the day; ran out of bags and forks. The platter concept is no good. putting a handfull or less of chips is not a good thing. Need bags of chips.There web site show their menu; but that is not what they have on the truck.I like the store locations just fine, but their truck is way below par for a food truck. They need to bring all the ingredents eith them and make the sandwichs right there, not pre made. 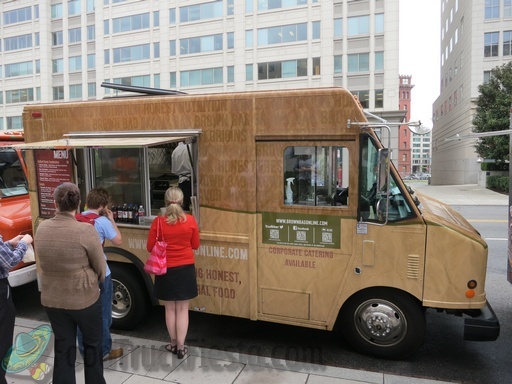 The Brown Bag food truck is the mobile version of the DC-area restaurant chain. They are committed to providing the freshest & healthiest food, serving all honest & natural paninis, Soups and Salads. Each day they offer four different grilled paninis, two soups made from scratch, three salads, and beverages. Serving Montgomery County, MD!